Manic News: An Open Letter to Rotten Tomatoes regarding "Kingsman: The Secret Service"
An Open Letter to Rotten Tomatoes regarding "Kingsman: The Secret Service"
It recently came to my attention that Kingsman: The Secret Service, does not have a "Certified Fresh" label, even though it has a Tomatometer rating of 75%. This seems like an oversight. 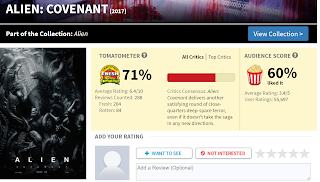 According to your website: "To receive a Certified Fresh rating a movie must have a steady Tomatometer rating of 75% or better. Movies opening in wide release need at least 80 reviews..." The snub is even more glaring when you realize there are movies with much lower Tomatomater ratings that are considered “Certified Fresh,” like Alien: Covenant (71%). Being "Certified Fresh" is what separate the good movies and the great movies. Kingsman: The Secret Service may have been a little underappreciated upon its release, but I suspect that as time goes on it will be recognized as a pivotal film that tackled important questions. Questions like: How do we deal with climate change? Is society overdependent on technology? Do clothes make the man? And is there a secret cabal plotting our destruction? The critics who reviewed Kingsman: The Secret Service have done their part. Now the ball is in your court. Do the right thing and please give this film the “Certified Fresh” label it deserves.